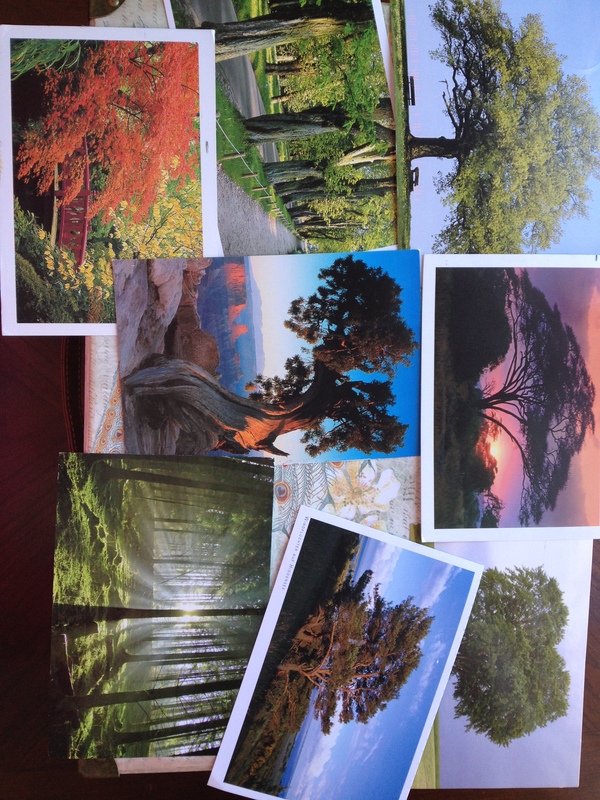 Last month I posted a picture of some of my heart postcards and asked which your favorite was (the heart-shaped tree beat the coffee beans by 1) so this month I thought I’d show you some of my tree postcards and see if you can choose a favorite. Interestingly enough, when I put these together and told a little about each sender I discovered that 7 of these 8 came from Germany. Germany must be a heaven for tree lovers! So which one catches your eye? they all speak different messages… couldn’t choose just one! LuV them all =) thanks for sharing the beauty ! It was impossible to pick just one. My favourites are the tree that are coming out of the rock in the desert and the one with the sunlight coming through the trees. What did you use to make the collage? Bottom left. I love the red bridge in the background. I couldn’t possibly pick a favorite! All your tree photos are stunning in different ways. Great images. i like the top/middle one the best. There are all gorgeous. It’s difficult for me to decide on a favorite but if I must choose it would be the light streaming through the forest in the bottom right corner. The tree with the benches, top left, is a close second. I would like to be sitting there with a book, listening to birds and enjoying the day, instead of being here in snowy, cold Chi-beria. It’s the benches I love in the top left one too! I think the one at bottom right is the one that sticks out the most to me. I love trees so much that it’s impossible to pick a favorite! They’re all gorgeous. They’re all lovely but I think I think I like the vertical one the best. They’re all fabulous trees and fabulous pictures, but I think the asian looking one with the bridge is my favourite. Love them all! I especially like the one with the bridge followed closely by the sun shining through the trees. Awesome pictures every one. The Fall tree shot is my favorite. I love fall and fall foliage! Those are all so pretty. I think my favorite is the one in the middle. All beautiful in different ways, but the fall one with bridge is a favorite. They’re all amazing but the one in the center catches my eye. Utah or Grand Canyon? The most amazing trees I’ve seen were in Sequoia National Forest though the Banyan Tree in “downtown” Maui is pretty spectacular, too. That middle tree came from the Czech Republic! I like the one that has the purple sky in the background, the one that appears to be near the Grand Canyon and the last one that reminds me of a Styx cover.